SMYNews: 2-Time NBA All-Star Luol Deng to Host Peace Event to Inspire Fellow South Sudanese in Diaspora to Unite. 2-Time NBA All-Star Luol Deng to Host Peace Event to Inspire Fellow South Sudanese in Diaspora to Unite. On the fourth anniversary of South Sudan’s independence, the Luol Deng Foundation is announcing South Sudan Unite, an event in Washington, D.C. to unite the South Sudanese diaspora in support of peace and reconciliation. The event will include live music from five South Sudanese artists, a high-end fashion show, and an inaugural workshop for its Peace Ambassadors initiative. 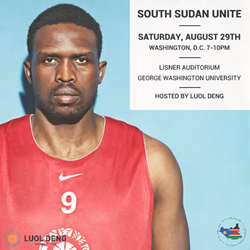 South Sudan Unite will take place at George Washington University’s Lisner Auditorium on August 29, 2015. In the eyes of the world, the conflict in South Sudan is an international issue that the government and rebels involved should resolve. However, for the people of South Sudan, this is a crisis that affects every man, woman and child deeply – whether at home or in the diaspora. For Luol Deng, peace is attainable if the people unite and join hands. Together, unity is possible. When South Sudan gained independence, the people celebrated as one, dancing in the streets all night and embracing one another without hesitation. Today those same people are divided. Optimism has been overshadowed by contempt. Community has been undermined by distrust. These divisions are not only inside South Sudan, but also throughout the diaspora communities. It is time to unite in order to save our promised future. The Luol Deng Foundation is a non-profit organization that uses basketball as tool to give hope to those in Africa, USA and the UK. Our work in the three different domains maps out to the life journey of founder Luol Deng, with each region having developed him in a different but significant way on his path to becoming an NBA star. Learn more at LuolDeng.org. NO MORE SAGGING! Brothers, pull up your pants. What Did America Give Blacks?